The Broke and the Bookish : Regarding Jana and "The Perfect Christmas"
How I got this book: Haha. Last November my mom had Swine Flu, so I became “Mom” to my family during the very end of the final semester of my senior year in college. I was so busy and stressed with turning in my senior project, writing papers, studying for finals, and working retail during the holiday season, that being a full-time mom as well almost pushed me over the edge. My mom felt bad for me and bought me this book to cheer me up during the stressful time. Needless to say, I was too busy to get around to it! 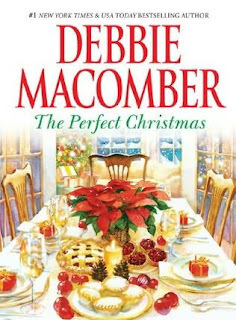 Why I read this book: I really love a good sappy Christmas romance during the holidays. I always have to read at least one! “What would make your Christmas perfect? Claiming he has her perfect mate in mind, Simon assigns her three tasks to complete before she meets him. Three tasks that are all about Christmas: being a charity bell ringer, dressing up as Santa's elf at a children's party, and preparing a traditional turkey dinner for her neighbors (whom she happens to dislike). Despite a number of comical mishaps, Cassie does it all—and she's finally ready to meet her match. Haha. Doesn’t that synopsis just make you smile? I knew that, ultimately, the entire book would be pure, predictable, fluff. But it was extremely sweet, and I did really enjoy it! I got pretty tired of listening to Cassie complain for the first 30 or so pages, but it got so much better once she was done introducing us to her predicament and venting about it. I adored Simon’s character. He was the scrooge of the book, who did not believe in love even though his profession was to help others find it. He was hard, cold, and not very likable at first. I loved the banter he and Cassie shared back and forth. As Cassie goes through the process of completing her three tasks, she experiences some funny things and also some heartwarming things. You grow to like her, and her totally awesome brother (I’d date him!). It does have a very sweet ending, and everyone is overflowing with happiness and the spirit of Christmas. I could have used some more content, and a few twists, but I think that might be asking for too much. It was a cute, fast, fluffy read but I love that at Christmastime! Now, it’s not a piece of literary genius, nor does it have a very original plot. It’s very predictable, and I knew from the very beginning what was going to happen. If you’re looking for a challenge, or looking to be captivated, then this is probably not the book for you. If you’re looking for a quick dose of cute (and clean) Christmas sappiness, then perhaps you’d take from this book the same thing I did! Discussion: What makes your Christmas perfect? Do you have special traditions? If you celebrate a different holiday, what makes that one perfect? As always, happy reading and happy holidays! I loved this line from your review: The people are sweeter than candy canes, merrier than the elves, and jollier than Saint Nick himself. I love Christmas books and movies that are like that! Even though its completely unrealistic its still fun to read. I miss the Christmas traditions from when I was younger. We haven't done them since my grandparents passed away. One tradition that my Mom has is she buys me and my brother each a Christmas ornament every year. All 3 pets even get their own ornament! I have ornaments ranging from baby's first Christmas to a school locker to a Starbucks cup. My brother even has an ornament of a video game controller. I read this one too! My mom recommended it- she loves all things Christmas books and movies! I thought it was super cute, as well!